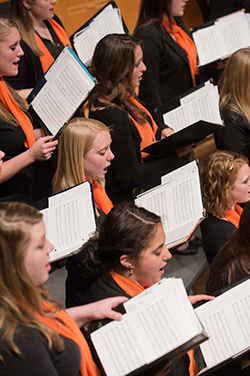 The Syracuse University Women’s Choir will present the concert “A Journey to the British Isles” on Thursday, April 16, at 8 p.m. in the Rose and Jules R. Setnor Auditorium, Crouse College. The concert is free and open to the public. Under the direction of Barbara M. Tagg, faculty member in the College of Visual and Performing Arts’ Rose, Jules R. and Stanford S. Setnor School of Music, and collaborative pianist Katia Dinas, the choir’s journey through the British Isles will include works by Tarik O’Regan, Michael Neaum, David Willcocks and Gustav Holst. Featured guest artists for Ralph Vaughan Williams’ “Magnificat” will be soprano Kathleen Roland-Silverstein and flutist Stephanie Mata. The choir will premiere Paul Carey’s “Full Fathom Five,” based on a text by William Shakespeare. This piece was commissioned by a consortium of American Choral Directors Association members representing women’s choirs throughout the United States. To conclude, concert bagpiper Avery Head will be featured in selections from “Ower the Hills,” a sweeping panorama of Scottish folklore and melodies. The SU Women’s Choir is a non-auditioned choral ensemble that includes graduate and undergraduate students who are music and non-music majors from across the Syracuse University and SUNY ESF campuses. Free and accessible parking is available in the Q-1 lot; additional parking is available in the Irving Garage. Campus parking availability is subject to change; call 315-443-2191 for current information. For more information about the concert, contact Tagg at 315-443-5750 or btagg@syr.edu.